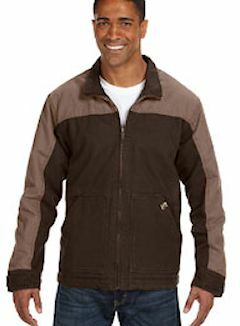 Custom Embroidered Carhartt Jackets, Cornerstone, embroidered Dri Duck Boulder Cloth Jackets, RedKap embroidered work jackets and Dickies work jackets. Light weight and heavy duty 12 oz. cotton duck embroidered with your logo. 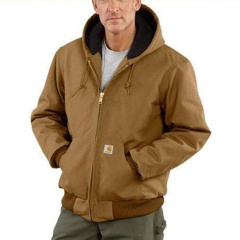 Embroidered Carhartt jackets are a great way to promote your company while on the job and meeting with clients. They are durable, long lasting and extremely warm. Dri Duck Boulder Cloth Jackets, embroidered with your logo is a new brand for OMD Embroidery, and offers durable construction for the working guy and another customer favorite for custom embroidered work jackets. 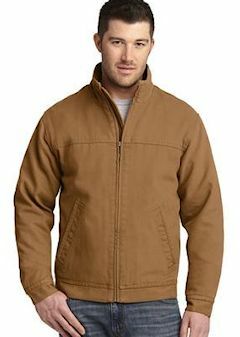 Need custom embroidered Flame Resistant Carhartt Jackets or custom embroidered Women's Carhartt Jackets please contact us for more information. Contact us today to order your embroidered work jacket for yourself or for your entire company! 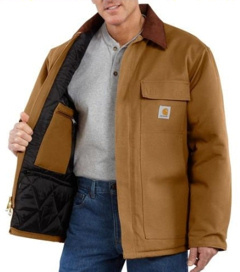 Custom Embroidered Carhartts: We carry many styles of Carhartts! 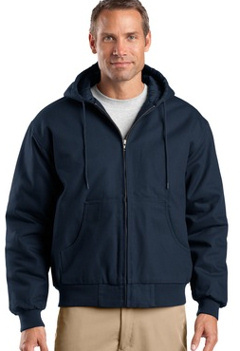 Custom embroidered 33237 Dickies Fleece-Lined Hooded Nylon Jacket. 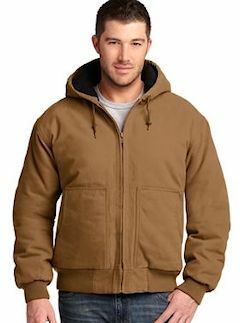 100% rip-stop nylon shell; 100% polyester fleece lining; ; Slash hand-warmer pockets and inside pocket; Polyurethane coating and durable water-repellent (DWR) finish; Set-in sleeves with elastic cuffs; drawstring bottom; drawcord hood with toggles; Dickies logo at lower left hem; Custom embroidered with your logo. This traditional Slash Pocket Jacket is a favorite for its rugged good looks, sturdy construction and versatility. 7.25-ounce, 65/35 poly/cotton twill, Permanently lined, Self-fabric collar with sewn-in stays, Two lower inset slash pockets, Utility pocket on left sleeve, Adjustable waist tabs. Custom embroidered with your logo. Custom embroidered Red Kap ® Team Style Jacket with Slash Pockets. CSJT38. 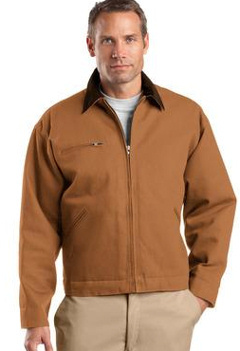 Ideal for even the toughest work, our durable jacket will keep you warm-without bulk. 7.25-ounce, 65/35 poly/cotton twill. Permanently lined. 1x1 rib knit collar, cuffs and waistband. Two lower inset slash pockets. Utility pocket on left sleeve Custom embroidered with your logo. Custom embroidered JT15 Dickies 8 oz. Lined Eisenhower Jacket. 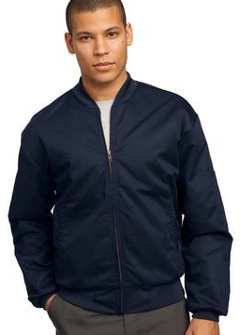 8 oz., 65% polyester/35% cotton vat dyed twill lightweight jacket; Lined with nylon taffeta and quilted to polyurethane foam; Water repellant, water resistant finish; Wrinkle resistant; Heavy duty brass zipper front closure; Pencil pocket on left sleeve; Slash front pockets. Custom embroidered with your logo. 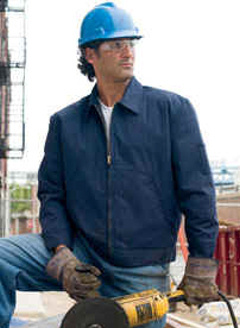 A workwear staple, this jacket has triple-needle stitching at the shoulders and armholes so it will last job after job. 12-ounce, 100% cotton duck cloth. 6-ounce polyfill nylon lining for added warmth. Corduroy collar. Bi-swing back. Zippered chest pocket. Adjustable 2-snap sleeves. Front slash pockets. Adjustable button waist tabs. Custom embroidered with your logo. Tall Sizes Available. 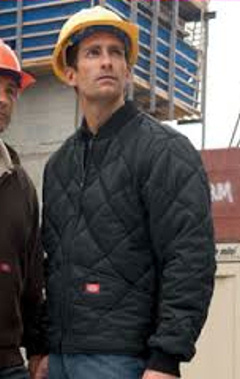 61242 Dickies Diamond Quilted Nylon Jacket. Custom embroidered 61242 Dickies Diamond Quilted Nylon Jacket. 2 oz, 100% nylon taffeta shell secured with diamond quilting; 5 oz., 100% polyester fill; Rib knit collar, cuffs and back waist; Front hand-warmer pockets and sturdy metal zipper; Durable water-repellent (DWR) finish; Polyurethane coating for water resistance; Custom embroidered with your logo. 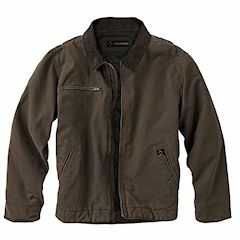 Tough enough to do the job, this work jacket layers easily over shirts and jackets so it's great for mild or harsh weather. 12-ounce, 100% cotton duck cloth. 6-ounce polyfill nylon lining for added warmth. Hood with dyed-to-match drawcord. Rib knit cuffs and waistband. Front hand warmer pockets. Custom embroidered with your logo. Tall Sizes Available. Custom embroidered with your logo. Custom embroidered DD5336 Dri Duck Trooper Jacket. Custom embroidered 5089 Dri Duck Horizon Jacket. Custom embroidered DD 5090 Dri Duck Laredo jacket. 12 oz., 100% cotton quarry washed Boulder ClothT canvas; textured thermal lining; three-piece hood; zippered chest pocket; inside cell phone and patch pockets with snap closures; articulated elbows; heavy-duty metal zipper featuring a DRI DUCK pull; drop tail with canvas facing. Custom embroidered with your logo. You have never felt a softer more durable jacket! 12 oz., 100% cotton quarry washed boulder cloth canvas. Diamond quilted brushed tricot lined body and hood. Inside cell phone and patch pockets with snap closure. Articulated elbows. Heavy-duty metal zipper with DRI DUCK pull. Rib knit cuffs and waistband with spandex. Custom embroidery included. Color SADDLE shown. This custom embroidered Carhartt Duck Active Jacket is built strong with 12-oz. 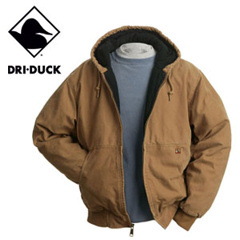 firm-hand 100% ring-spun cotton duck and a lightweight 100% polyester thermal lining for on-the-job warmth. 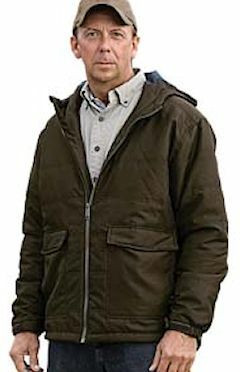 For extra protection from the elements this jacket includes an attached three-piece thermal-lined hood and the rib-knit cuffs and bottom work to keep out the cold. 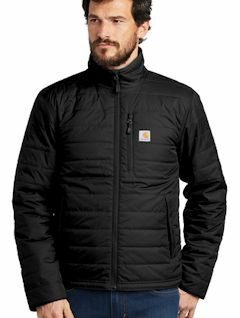 Carhartt has equipped the Duck Active Jacket with two large hand-warmer pockets and two convenient inside pockets for ample storage. 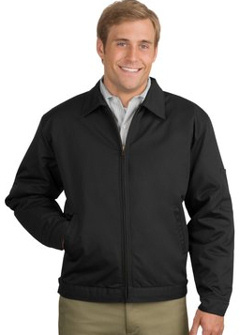 The main seams in this jacket are triple-stitched for long lasting durability. 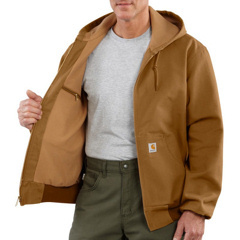 Carhartt produces their outerwear linings with specific levels of comfort and warmth in mind. Custom Embroidered with your logo. 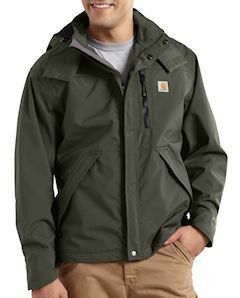 Lightweight, yet warm, this jacket is amazingly durable and dependably water repellent. 1.75-ounce, 100% nylon Cordura ® shell. Rain Defender ® durable water repellent. Wind Fighter ® technology tames wind. Nylon lining quilted to 100-gram polyester insulation. Reverse coil center front zipper. Zip-through cadet collar. Left chest map pocket with reverse coil zipper. Two hand pockets with hidden snap closures. Two interior pockets: one zippered, one hook and loop closure. Hook and loop adjustable cuffs. Drawcord adjustable hem. Carhartt-strong, triple-stitched main seams. Carhartt label sewn on chest pocket Custom Embroidered with your logo. Custom embroidered J140 Duck Active Jac - Quilted-Flannel.Rugged 12-ounce 100%-cotton duck, 100%-polyester quilted flannel heavy-weight lining, with quilted lining in sleeves ,Attached quilted flannel lined hood with adjustable draw cord, Zipper front with two hand-warmer pockets, Rib-knit cuffs and bottom band. Custom Embroidered with your logo. Custom embroidered C003 Carhartt Duck Traditional Coat - Arctic Lined . Gear up for the cold with our duck traditional coat featuring a nylon lining quilted to arctic-weight polyester insulation. Made of 12-ounce, 100% ring-spun cotton duck, the coat is equipped with two chest pockets, two large lower front pockets, and two inside pockets. The corduroy collar offers under-collar snaps to accommodate an optional hood. The main seams are triple stitched, and the split back plus pleated elbows work to ensure easy movement. Custom embroidery included. Our waterproof breathable jacket is a shorter version of our waterproof breathable coat and is made of durable nylon with a special water-repellent finish. Its breathable membrane allows body heat to leave the garment even as it keeps rain and moisture out. 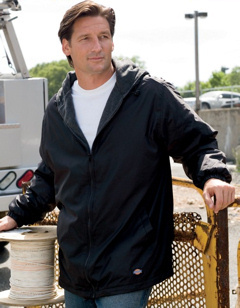 The interior body lining is a 100% polyester mesh, with the sleeves and hood lined in nylon. 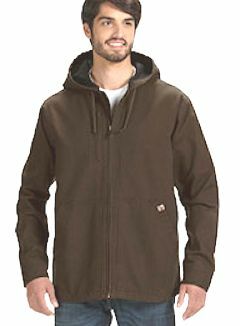 The contoured three-piece hood features an adjustable draw cord and is removable. The hem is finished with an elastic drawcord to keep out wind and cold. Custom Embroidered with your logo.